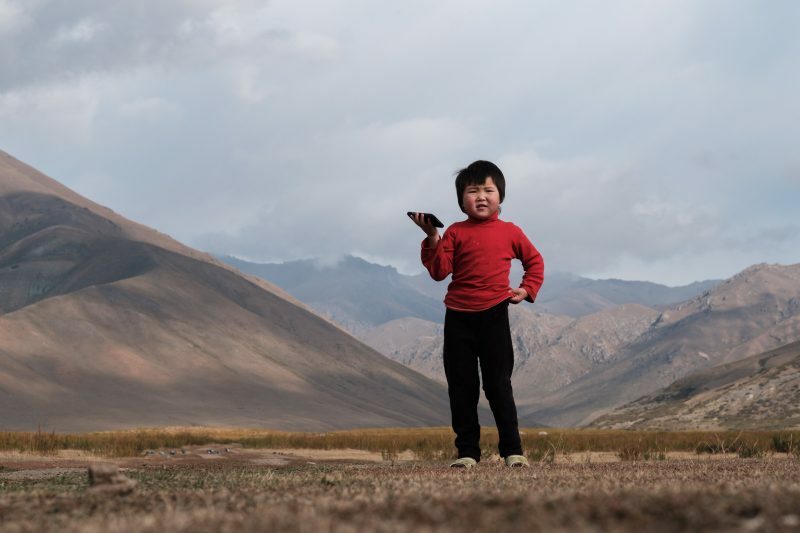 Rayana Imankulova (4), pictured on 13 September 2018, lives with her parents Akylbek Imankulov (46) and Gulzat Raimbekova (43) in the rangelands of Tokoilu in the Suusamyr Valley in Kyrgyzstan. Photo used with permisson by Internet Society / Nyani Quarmyne / Panos Pictures. This country report was written by Isabek Asanbaev and Talant Sultanov of the Internet Society Kyrgyzstan Chapter. Please visit the GISWatch website for the full report which is also available under a CC BY 4.0 license. Roughly 25% of Kyrgyz citizens are online, with 64% of these living in urban areas. While community networks can help rural citizens access the internet and narrow the digital divide, they are not mentioned at all in the country’s information and communications technologies (ICT) policies. Radio spectrum is also heavily regulated and one has to apply to register frequencies. The process can take around six months. The aim of the Suusamyr community network is to create business opportunities in tourism for the community, as well as to offer the community a chance to learn new skills and develop human capital. The internet will also improve the quality and availability of social services, and promote accountability through enabling the closer monitoring of municipal bodies. This report outlines our progress so far, and what we need to do next. The ISOC Chapter in Kyrgyzstan was established in 2014. ISOC officers from headquarters in the United States then presented the idea of community networks to us, giving the example of the so-called “barefoot engineers” in Nepal who went from village to village and set up community networks. This example got the Chapter members very excited. Later in 2016 the ISOC Kyrgyz Chapter hosted a roundtable on community networks and brought a presenter from India, who spoke about a community network that helped an Indian village enter the e‑market with their unique handmade textiles. One of the participants at the roundtable was a self-employed engineer who built antennas that strengthen the signal of the mobile internet for people in locations with poor coverage. He was very excited about the idea of community networks. The Chapter immediately took him into consideration as an engineer for the community network project. We started applying for ISOC’s Beyond the Net funding in the hope of securing a grant. Applications for Beyond the Net funding are primarily accepted from ISOC Chapters or projects with an ISOC Chapter actively involved. ISOC supports projects that help the community, providing tools and skills and creating visibility for the Chapter. We started looking for a suitable location. 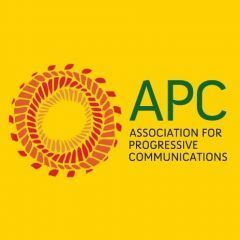 The main criteria was that it should have no internet of any kind, which meant no mobile data coverage, and that internet service providers (ISPs) were not likely to offer services in the community any time soon. We found a promising village near the famous tourist attraction called San Tash – two large piles of stones in the Karkara Valley, which have intrigued archaeologists for centuries. There are several theories about how and why they came into existence. 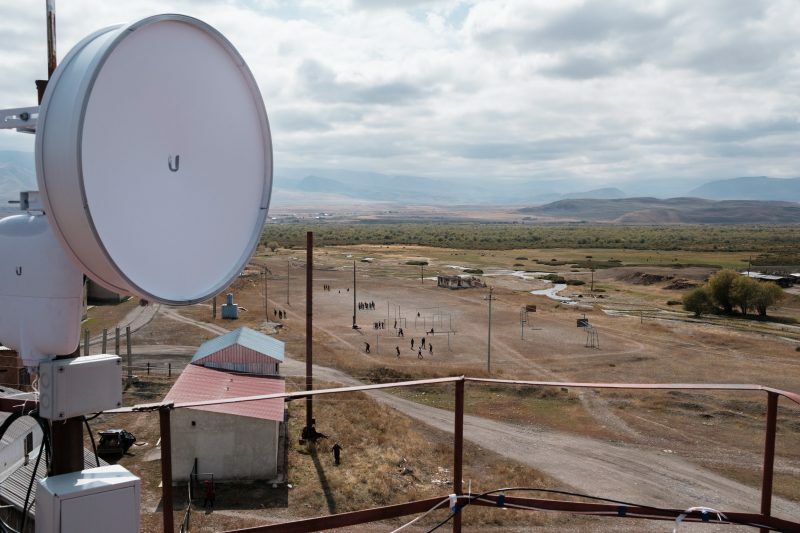 A dish bringing a high-speed wireless Internet link to village of Suusamyr, which lies above 200m in a valley of the same name in the Tian Shan Mountains in Kyrgyzstan, on 13 October 2018. The village is home to community network Suusamyr Net, and now that the main link has been established, the network will soon be providing residents with connections by fibre to the home. Photo used with permission by Internet Society / Nyani Quarmyne / Panos Pictures. The history of San Tash goes back more than half a millennium. One explanation of the piles of stones goes like this: When the Mongol warlord Tamerlane (also known as Amir Timur) was going to battle, he told each of his warriors to find one stone and throw it onto a pile. They did so, and by the time they finished there was a huge pile the size of a hill. When they returned from the battle, Tamerlane told them to do it again. As a result, there were two hills of stones, both hills of different sizes. That is how he counted his losses. The piles have been there for centuries. Many people from all over the world come to see them. The locals make business from the tourists, and we hoped that internet access via a community network would help the community attract more tourists, and make searching for accommodation and other services more accessible to the visitors. Winter passed and fortunately for the villagers a government-owned ISP had begun offering connectivity to the village. For us it meant that we had to once again search for a suitable location. The search was long, as the criteria were hard to match and even harder to verify since we had to physically travel to all the possible locations. We needed a village that was not connected – preferably not even with mobile data – but was still within 50 km from the backbone of any ISP that was willing to cooperate (many do not want the competition of a community network). We travelled all around the country, which is relatively small but very mountainous. There were several other promising villages. One of them was Sheker, a village in the Talas region in the northwestern part of the country, and home of Kyrgyzstan’s most prominent person, the writer Chyngyz Aitmatov. One of his greatest novels is called “The First Teacher”, a story about the first educated person who came to a remote village to teach children during the times of Lenin. This year will be the 90th anniversary of Aitmatov’s birth, and it will be widely celebrated throughout the Turkic world and the former Soviet Union. It would be great, we felt, to give Sheker another “first teacher” in the form of a community network. However, later we found out that it was impossible to connect the village using our equipment, as it required more than one repeater. We needed to hasten the search, so we found a wholesale ISP with the second-largest backbone in the country, Elcat, and negotiated with them. They shared a map of their backbone infrastructure with us, which included coordinates of their nodes. This narrowed down our search dramatically and we finally decided on the village of Suusamyr. We visited the village and spoke to the head of the Local Self Government (LSG). He informed us that there was no internet of any kind available in the village. The reason is that the valley – also called Suusamyr – is surrounded by high-altitude mountains, making it hard to connect to the internet. The winter in the valley also lasts for six months instead of three. 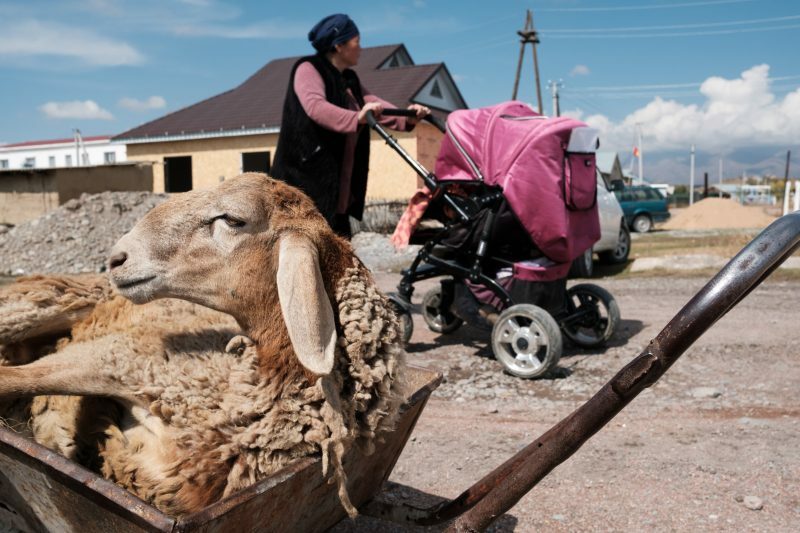 A sheep in a wheelbarrow beside the main street of the village of Suusamyr, which lies above 200m in a valley of the same name in the Tian Shan Mountains in Kyrgyzstan, on 14 October 2018. The village is home to Suusamyr Net, a community network that has brought a high-speed Internet link to the community, and will soon be providing residents with fast connections by fibre to the home. Photo used with permission by Internet Society / Nyani Quarmyne / Panos Pictures. The population of Suusamyr is 2,674 people according to the 2009 population census. The length of the valley where it is located is 155 km. The altitude of the bottom of the valley ranges from 2,000 meters to 3,200 meters above sea level. The valley is full of beautiful vistas: mountains, forests, lakes and rivers. It is one of the top tourist destinations in Kyrgyzstan. Some popular tourist activities include hiking, rafting, horseback riding, paragliding, and kumis, the seasonal mare’s milk detox. The first stage of the project involves setting up a wireless link that will connect the village to Elcat's fibre-optic backbone. The wireless link will use AirFiber AF-5X 5.8 GHz radio systems, with 34 dBi antennas installed on 15-metre-high masts. To increase the speed, a MIMO Multiplexer will be installed, allowing us to use four airFiber radios with a single dish antenna. The second stage is building a fibre-optic network in the village. This will include the installation of several distribution boxes at the crossroads in the village where the fibre-optic highway runs. At first we aim to connect 50 subscribers free of charge. These will include schools and municipal buildings, as well as low-income families. One proposal that the community made was to increase the presence of local businesses on the web. For example, guesthouses in Suusamyr would be registered on websites such as Booking.com, making them more accessible to modern tourists. However, overall, most villagers should benefit from the community network, as it is common for people to share resources with fellow villagers, especially given the fact that most villagers are related to each other. For example, one can go to a neighbour’s house to use the internet for a short time to search for necessary information or get some social service that is provided by the government online. The community network will increase the availability of a number of social services that are available online and otherwise would require travel to the regional centre many kilometres away. These include applying for a passport, registering a vehicle or real estate, registering a marriage or getting a divorce, and for biometrical registration. The main obstacle that made us lose all our hope was the requirement to register the use of frequencies. We thought that we could use certain frequencies as long as nobody else was using them. When we found out that we needed to register them and that it takes half a year just to go through the application process, we were devastated for about a week. It would be helpful if obtaining frequencies took less time – one month, for example. In comparison, obtaining a data transfer licence takes three to four weeks, and is not that hard. 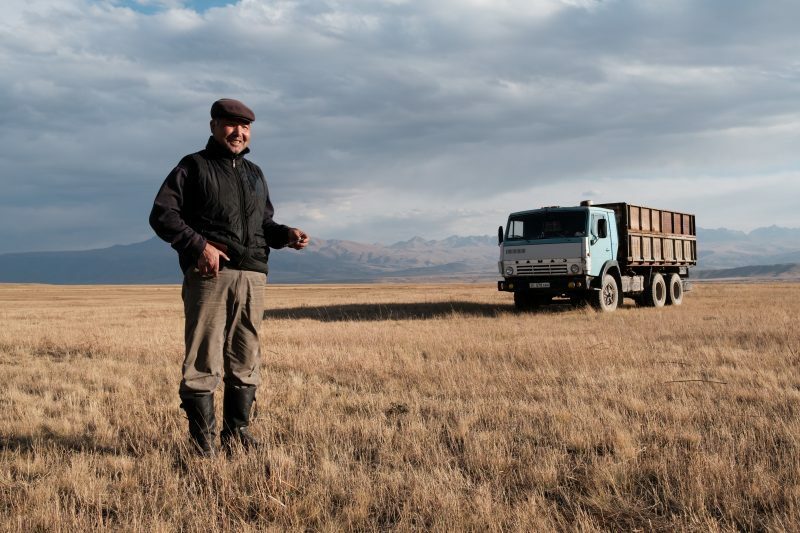 Elchibek Karabaev, 58, pictured on 12 September 2018, is a farmer in the Suusamyr Valley in the Tian Shan Mountains in Kyrgyzstan, where he has 20 hectares of grain fields, 200 sheep, 40 horses and 10 cows. He does not use the Internet for doing business himself, but he sees the importance of fast and reliable connectivity in the valley. Suusamyr is very mountainous and underdeveloped. It is known for its rough climate and the harsh winters. Internet will help to bring this place forward, Karabaev says. The Internet has a lot of benefits. We get more news. Before there was only one TV channel and two weekly papers that reached us here. Now we can get news from all around the world. Photo used with permission by Internet Society / Nyani Quarmyne / Panos Pictures. Because of this we started looking for alternative solutions. It was most feasible to find a company that had registered frequencies and that was willing to cooperate. We discovered Skynet Telecom LLC. Skynet will be buying internet bandwidth from Elcat and selling it to the community network at a small margin. Another challenge, but one we anticipated, was the terrain. There is no direct visibility from the Elcat node to the village. We still need to connect to the Elcat backbone, so that Skynet can buy the bandwidth for the village. We have to install a repeater that has direct visibility to both the Elcat node and the village. We have found a perfect location for the repeater and are currently installing a mast on the hill. For more information regarding action steps for Kyrgyzstan, please visit the full report on the GISWatch website. Suzanne Lehn assisted in the preparation of this republication.